Wetlands protected by national governments to fulfil their obligations under the Convention on Wetlands of International Importance (commonly called the Ramsar Convention). Ramsar Sites Information Service provides access to information on Ramsar sites, including downloadable GIS data of the sites. Upon joining, each Contracting Party is obliged to designate at least one wetland site for inclusion in the List of Wetlands of International Importance. The main objective of this key obligation is “to develop and maintain an international network of wetlands which are important for the conservation of global biological diversity and for sustaining human life through the maintenance of their ecosystem components, processes and benefits/services”. 2 There are currently 168 Contracting Parties to the Ramsar Convention. The Convention uses a broad definition of wetlands as “areas of marsh, fen, peatland or water, whether natural or artificial, permanent or temporary, with water that is static or flowing, fresh, brackish or salt, including areas of marine water the depth of which at low tide does not exceed six metres”. 3 Wetlands to be included on the List may incorporate riparian and coastal zones adjacent to the wetlands, and islands or bodies of marine water deeper than six metres at low tide lying within the wetlands. The Convention on Wetlands of International Importance especially as Waterfowl Habitat (Ramsar Convention). There are also five International Organisation Partners (IOPs) which work closely with the Convention and have been associated with the treaty since its beginnings. These are: BirdLife International, The International Union for the Conservation of Nature (IUCN). The International Water Management Institute (IWMI), Wetlands International and WWF. The Ramsar Convention was adopted in 1971 and entered into force in 1975. Global network of over 2100 wetland sites within 168 countries. 4 The designation of Ramsar sites is an ongoing process and more countries are expected to join the Convention in the future. 1. Contains a representative, rare or unique example of a natural or near-natural wetland type found within the appropriate biogeographic region. 2. Supports vulnerable, endangered, or critically endangered species or threatened ecological communities. 3. Supports populations of plant and/or animal species important for maintaining the biological diversity of a particular biogeographic region. 4. Supports plant and/or animal species at a critical stage in their life cycles, or provides refuge during adverse conditions. 5. Regularly supports 20,000 or more waterbirds. 6. Regularly supports 1% of the individuals in a population of one species or subspecies of water birds. 7. Supports a significant proportion of indigenous fish subspecies, species or families, life-history stages, species interactions and/or populations that are representative of wetland benefits and/or values and thereby contributes to global biological diversity. 8. Is an important source of food for fishes, spawning ground, nursery and/or migration path on which fish stocks, either within the wetland or elsewhere, depend. 9. Regularly supports 1% of the individuals in a population of one species or subspecies of wetland-dependent non-avian animal species. Responsibility for the management of Ramsar Sites is at the national level, by the officially appointed Administrative Authority of the Contracting Party. The Ramsar Convention encourages Parties to create National Ramsar Committees to act as the appropriate Administrative Authority. In some cases, Ramsar sites are transboundary in which case more than one Contracting Party is responsible for their conservation and management. The Convention outlines several compliance requirements for the Contracting Parties. 3 The four main commitments include designating at least one wetland to the Ramsar List, incorporating wetland conservation considerations into national land-use planning, cooperating internationally and establishing nature reserves in wetlands with the appropriate training to manage these. 6 In cases where changes in ecological character of a Ramsar Site have occurred, are occurring, or are likely to occur as a result of technological developments, pollution or other human interference, the Contracting Party is required to report this, without delay, to the Ramsar Secretariat (article 3.2), which is required to report all such notifications to the next Conference of Contracting Parties, which may make recommendations to each Contracting Party concerned (article 8). The Contracting Party can choose to place such Sites on the so-called “Montreux Record”. Sites on the Montreux Record face concerted action by the Ramsar Secretariat, the Scientific and Technical Review Panel and the Contracting Party concerned to resolve the ecological character changes or likely changes, including through international expert Ramsar Advisory Missions. The boundaries of a designated Ramsar Site may only be restricted or deleted if the Contracting Party determines that it is in its “urgent national interest” (article 2.5), in which case the Party must make adequate compensatory provisions (article 4.2). 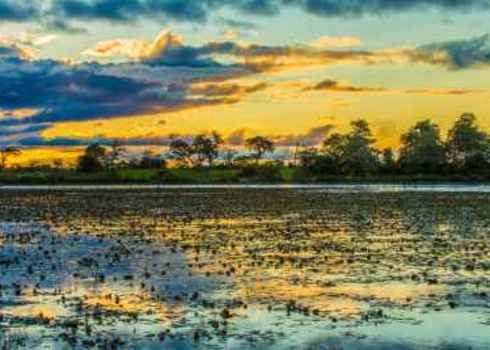 Guidelines for the allocation and management of water for maintaining the ecological functions of wetlands. Legal and compliance - Protection under national law is not a precondition for designating a site as a Wetland of International Importance, but legal recognition and protection is likely to be present for many Ramsar sites. There are several guidelines, which necessitate ensuring protection of Ramsar sites by the Contracting Parties. 7 The Convention requires Contracting Parties to ‘formulate and implement their planning so as to promote the conservation of the wetlands included in the List, and as far as possible the wise use of wetlands in their territory’ (article 3.1). 3 However, the Ramsar Convention explains that “whether or not Ramsar status conveys additional legal protection in-country depends upon the national and local policy and legislation concerning Ramsar sites, which varies from country to country”. 3 The Ramsar Convention is not a regulatory regime and has no punitive sanctions for violations of or defaulting upon treaty commitments. As internationally recognised sites, Ramsar sites enjoy a high degree of local, national and international attention. Based on their level of visibility and importance for conservation, they are referred to in a number of safeguard standards of financial institutions, including the International Finance Corporation 8, the European Investment Bank 9, the Asian Development Bank 10, the European Bank for Reconstruction and Development 11, and the Inter-American Development Bank 12, whereby operations within Ramsar sites are unlikely to be funded. These standards refer to those that have been designated as well as areas officially proposed for protection. Ramsar sites are also referred to in the standards of certification schemes in a range of business sectors such as the Roundtable on Sustainable Biomaterials (RSB) 13, as well as standards such as the Climate and Community and Biodiversity Alliance standards 14. For example, under RSB standards Ramsar sites are considered no-go areas. Biodiversity importance - Wetlands are recognised as internationally important sites for biodiversity conservation. The criteria used for their inclusion on the list include irreplaceable and vulnerable species and habitats, and therefore many of these areas are likely to be of high global biodiversity value. As site-scale areas, these sites are highly relevant to business in terms of mitigating and avoiding risk from biodiversity loss and identifying opportunity associated with biodiversity conservation. Studies at national level indicate that the designation of a Ramsar site, along with appropriate protection under the Ramsar Convention, tends to lead to increases in bird abundance and species richness 15. Socio-cultural values - Although these sites are identified on ecological criteria, they are managed under the concept of ‘wise-use’, and therefore sustainable human activities and the involvement of local communities in management are to be expected in these areas. The Ramsar Convention has adopted ‘Guidelines for establishing and strengthening local communities’ and indigenous people’s participation in the management of wetlands’ as annex to Resolution VII.8 16. The Guidelines address the need for involvement of local communities and indigenous peoples in a management partnership. Ramsar Convention Secretariat. The Ramsar Strategic Plan 2003-2008. Ramsar Convention Secretariat. Resolution IX .1 Annex B Revised Strategic Framework and guidelines for the future development of the List of Wetlands of International Importance. (2005). Ramsar Convention Secretariat. The Convention on Wetlands of International Importance especially as Waterfowl Habitat. UN Treaty Series No. 14583. As amended by the Paris Protocol, 3 December 1982, and Regina Amendments, 28 May 1987. UN Treaty (2 February 1971, Ramsar, Iran, 1971). Ramsar Convention Secretariat. The Ramsar List of Wetlands of International Importance. Ramsar Convention Secretariat. The Criteria for Identifying Wetlands of International Importance. (2005). Ramsar Convention Secretariat. The Guidelines adopted by the Conference of the Contracting Parties. (2013). The Climate Community and Biodiversity Alliance. Climate, Community & Biodiversity Standards Third Edition. (2013). Kleijn, D., Cherkaoui, I., Goedhart, P. W., van der Hout, J. & Lammertsma, D. Waterbirds increase more rapidly in Ramsar-designated wetlands than in unprotected wetlands. J. Appl. Ecol. 51, 289–298 (2014). Ramsar Convention Secretariat. Resolution VII.8: Guidelines for establishing and strengthening local communities’ and indigenous people’s participation in the management of wetlands. (1999).